Celebrity Cruises has announced the fleet is going to be transformed with new features, upgrades, experiences and just about everything! 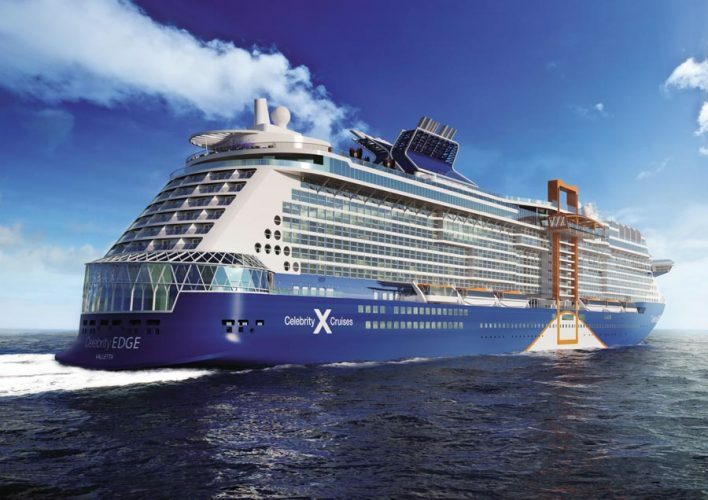 Celebrity cruise ships will be brought up to the modern innovative standard of the upcoming Celebrity Edge cruise ship which is arriving later in 2018. Celebrity Cruises has launched “The Celebrity Revolution” which is a huge $500 Million investment. The entire fleet will receive new updates on just about everything to bring them inline with Celebrity Edge, a new generation cruise ship arriving in November 2018. In fact, the cruise line said that they already started the revolution with Celebrity Edge and the small luxury vessel named Celebrity Flora which you read more details about here. There’s so much to mention and to cover including cruise ship renovations and what will the cruise line be focusing on. Thankfully Celebrity revealed a new video explaining everything and teasing us with some shiny fresh renderings of how things will look. Onboard suites will be a major part of the investment and several Celebrity ships have already been updated with the help of visionary designer Kelly Hoppen. More vessels will also receive the new Suite and Signature Suites already featured on the Celebrity Reflection ship. Celebrity Solstice, Celebrity Eclipse, Celebrity Equinox, and Celebrity Silhouette will all get Kelly’s touch. New Retreat Sundeck and The Retreat Lounge venues will be added Fleet-wide for all suite guests. The new spaces the chill have been inspired by the upcoming Celebrity Edge’s The Retreat. The guest favorite restaurant called Qsine will be added across the fleet. The venue will also be renovated to be even better. The popular Oceanview Cafe will be changed into a more open plan marketplace experience and ship dining rooms will be refurbished with new looks. There will be a new shopping experience on all ships with updated stores and expanded brands such as Shinola, John Hardy, and Hublot. Elevated bars and lounges will be added during renovations including the newly reimagined Passport Bar and an expansion of Celebrity’s popular Gastrobar concept. Take a look at all of these Celebrity cruise accessories for your cruise vacation. There’s going to be a ton of updates which no doubt Celebrity Cruises will go into more specific details when each ship undergoes the makeover. The iconic Celebrity Millennium will be the first to under a major dry dock in 2019 and receive all the new exciting features and updates. More ships will be renovated through 2023 so do keep checking Cruise Hive for the latest on this.